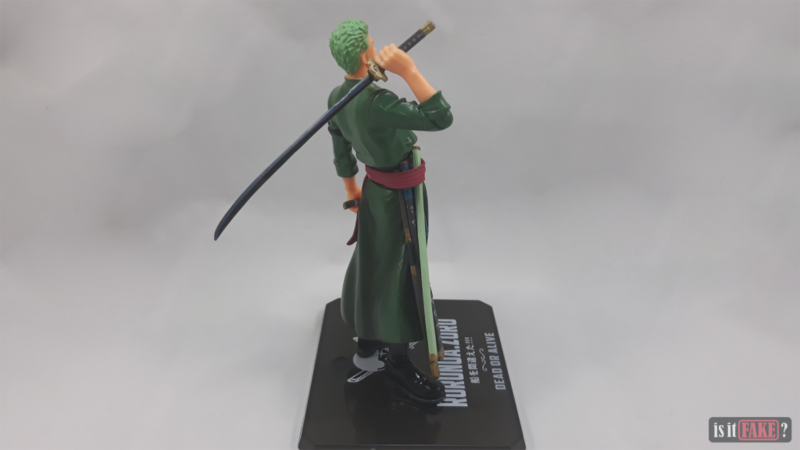 As a feared bounty hunter who once hunted pirates, Roronoa Zoro aspired to be the greatest swordsman in the world of the popular anime, One Piece. Though after meeting Luffy, his direction as the world’s most feared “Pirate Hunter” turned sideways as he becomes a pirate himself. 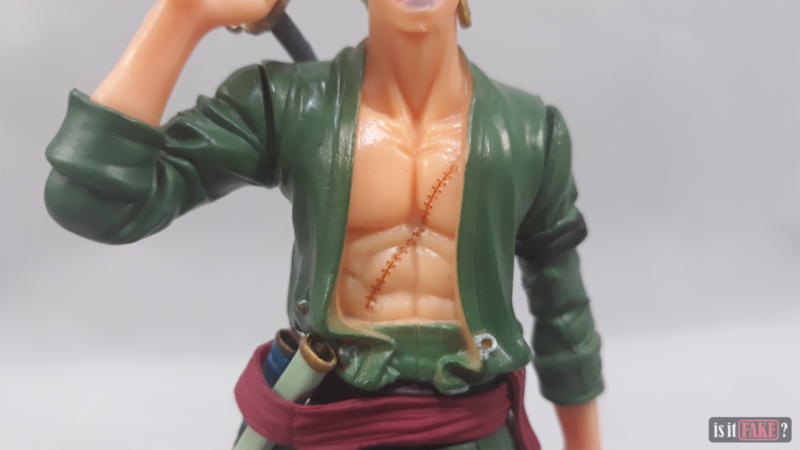 As a member of the Straw Hat Pirates, he joins Monkey D. Luffy in search of the greatest treasure, the One Piece, challenging the vicious ocean waves of the Grand Line. While that tale has long been told, One Piece had already gone through numerous arcs that made the characters undergo several developments, but of course, we’re going to save you from spoilers. 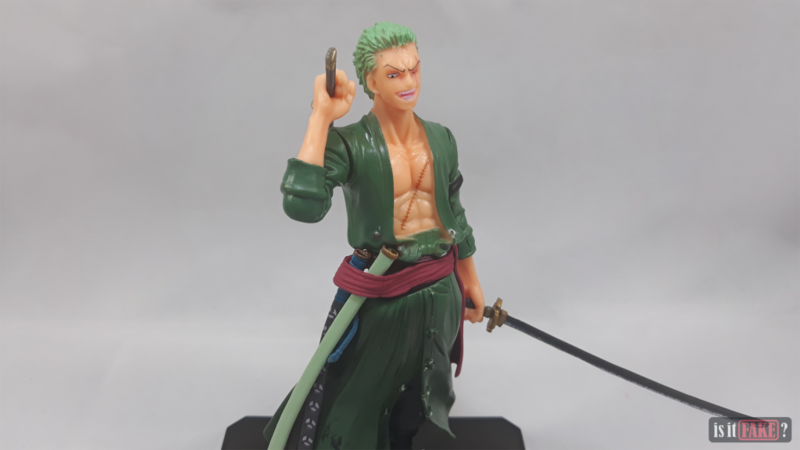 And even though the anime have already aired more than 800 episodes, anime fans just couldn’t get enough of One Piece especially when Bandai stepped in to transform One Piece characters into their renowned figure collection of Figuarts ZERO. 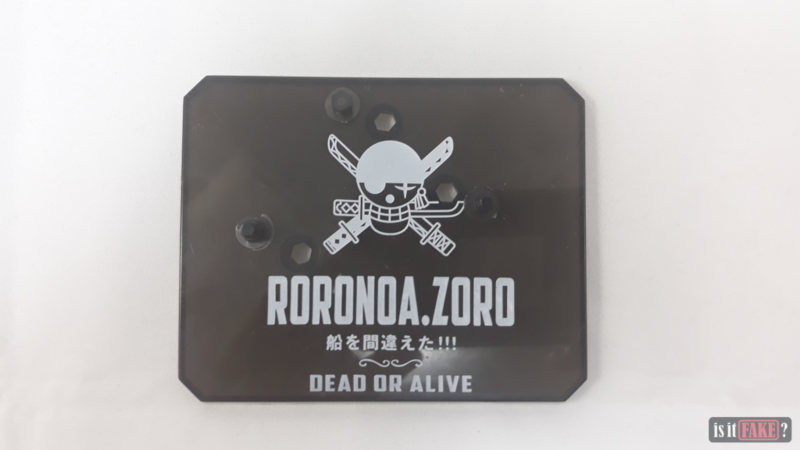 Little did the Straw Hat Pirates know, there are far more notorious pirates waiting for them in a strait going to Grand Line. These pirates can imitate anyone, but they’re only notorious at making awful copies. They will use this method to face our favored Straw Hats but will eventually fail. We’ve got all our sources of legit anime figures whether it be that one website where we usually buy from or another that’s just as trusted. 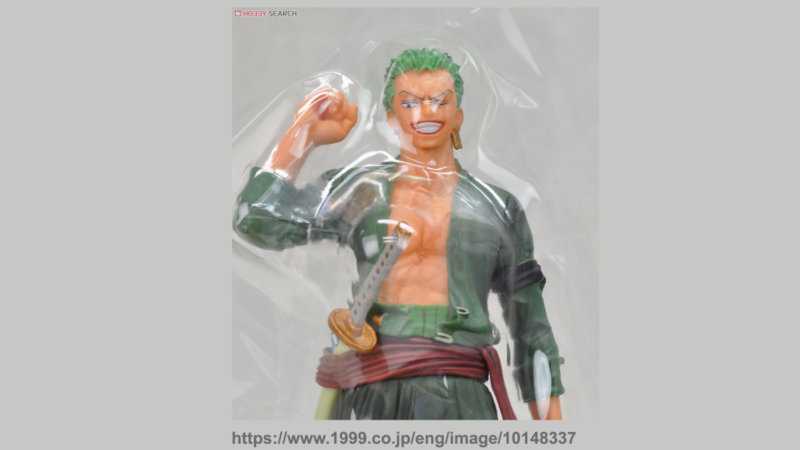 On the other hand, there are websites like AliExpress where such figures are to be avoided because more often than not, they’re going to be bootleg figures. 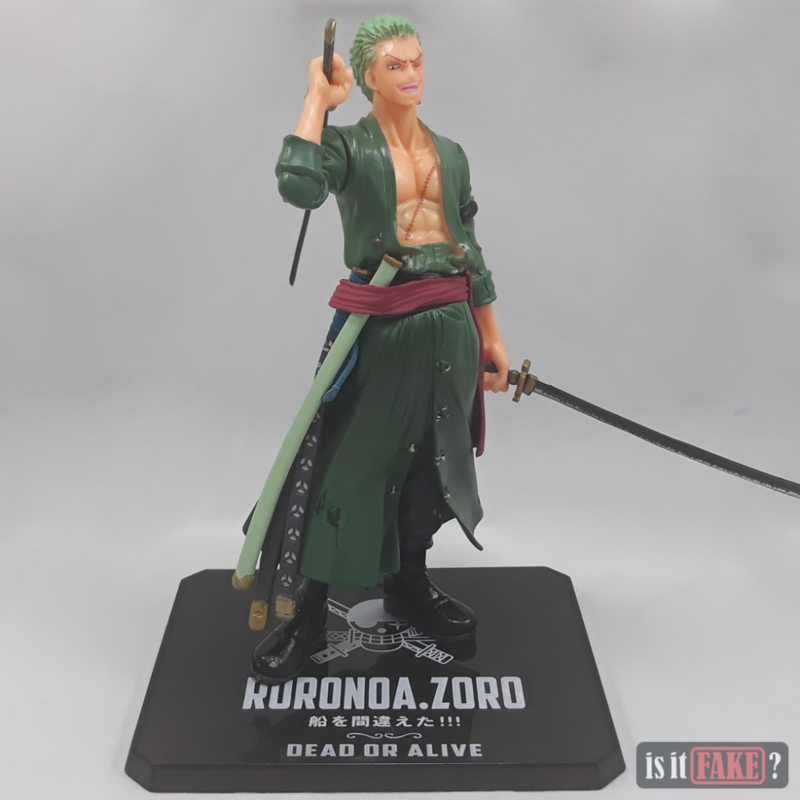 Let’s say you come across happyparadise store and you’re intending to buy fake items because you thought that you they’re cheaper than the real figures. Indeed they are, but what it costs you is a bunch of mishaps and deficiency. Not only that you get an incomplete set of figures but you’d also probably be regretting buying one since you’ll only get an inferior item. 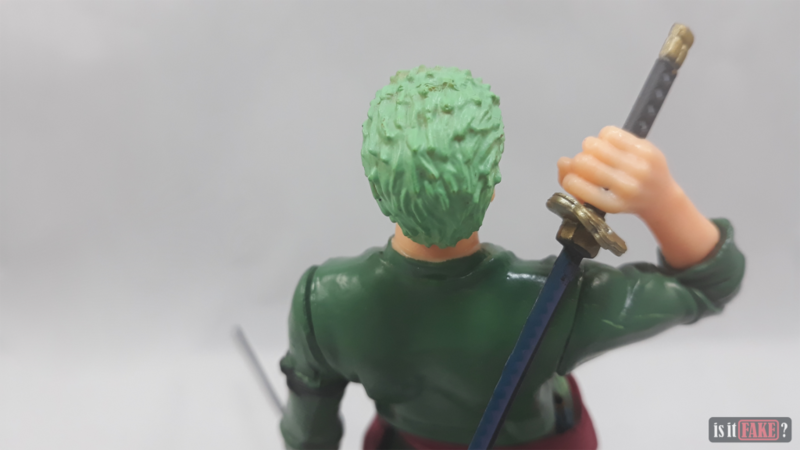 Take this fake Figuarts ZERO Roronoa Zoro figure as a sign of caution if you’re going to consider settling for a bootleg figure. 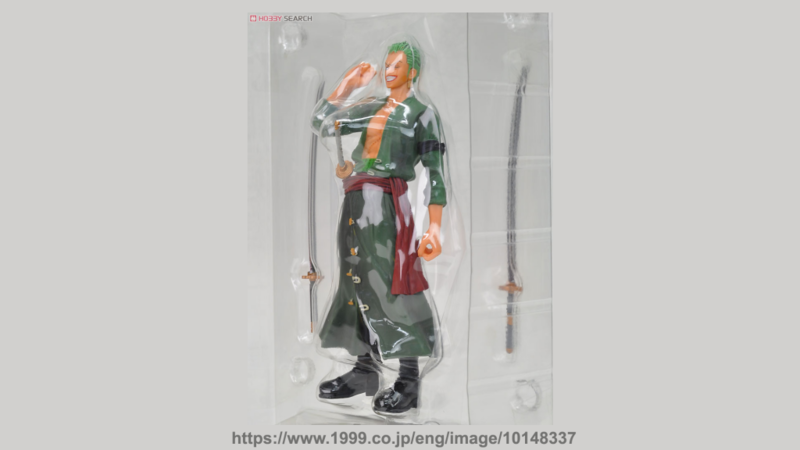 Authentic anime figures, especially one from Bandai’s renowned collection of Figuarts ZERO, will be packaged in a branded box. 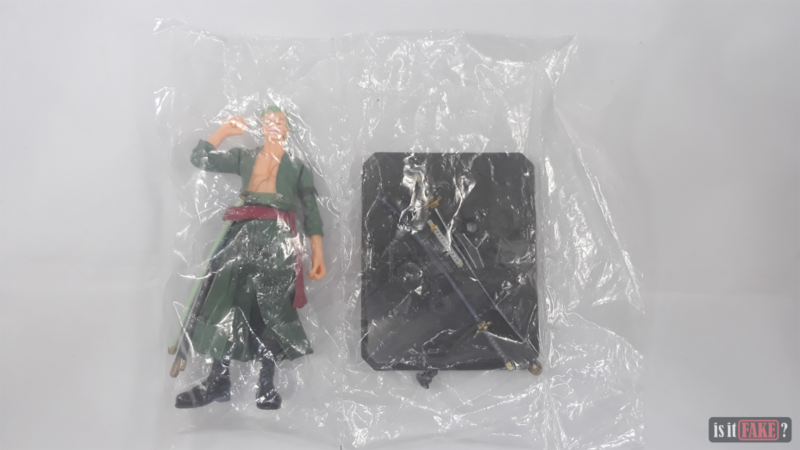 Not surprisingly, however, this fake Figuarts ZERO Zoro figure only came with the components inside a sealed plastic. 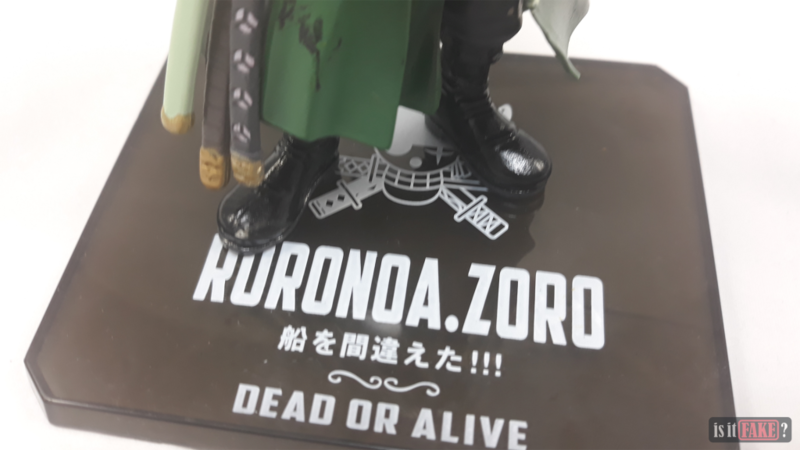 The real Figuarts ZERO Roronoa Zoro figure’s box would have the logo of its manufacturer, Bandai as well as the logo of the collection, Figuarts ZERO. 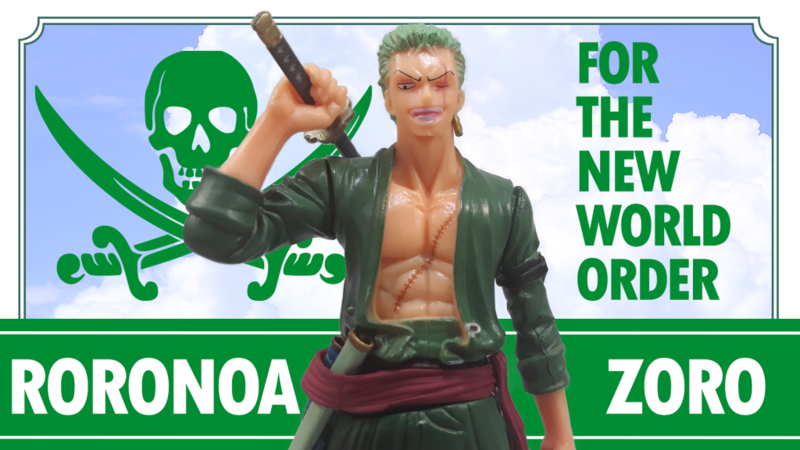 Since the figure is licensed by Toei Animation, an authentication by the licensor should also be found on the box. 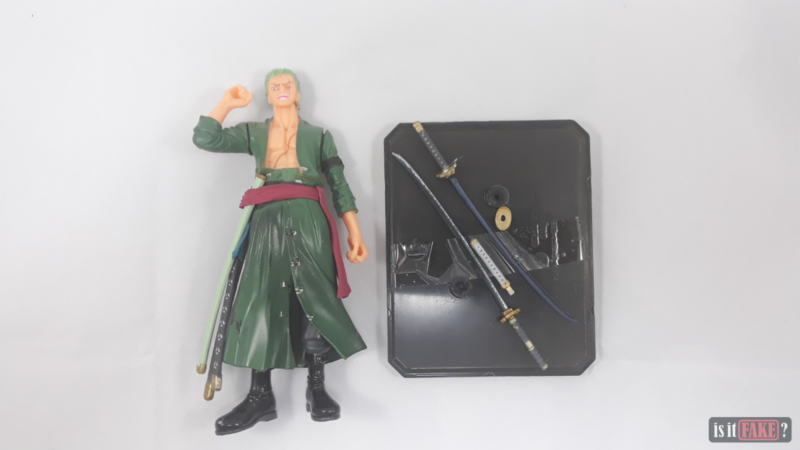 The fake figure’s components include the figure itself, the base, 2 swords, and a sword handle for Zoro’s most-endeared katana. 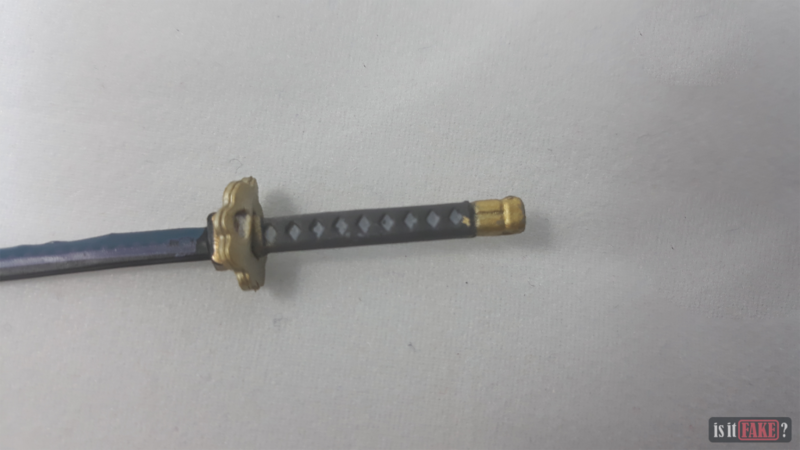 The fake figure’s base shows off a translucent finish, and while that looks normal, the attachable bits seems like they’re retractable. 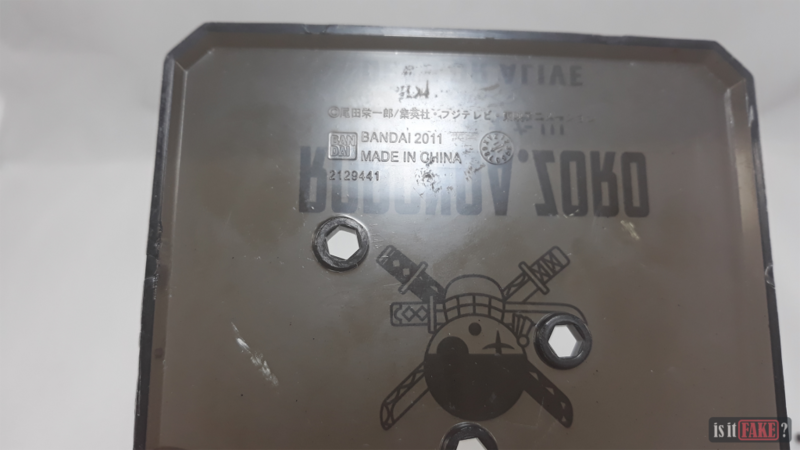 Turning the base over, you’ll be able to notice a copyright imprint in Japanese, the Bandai logo, and the item number. 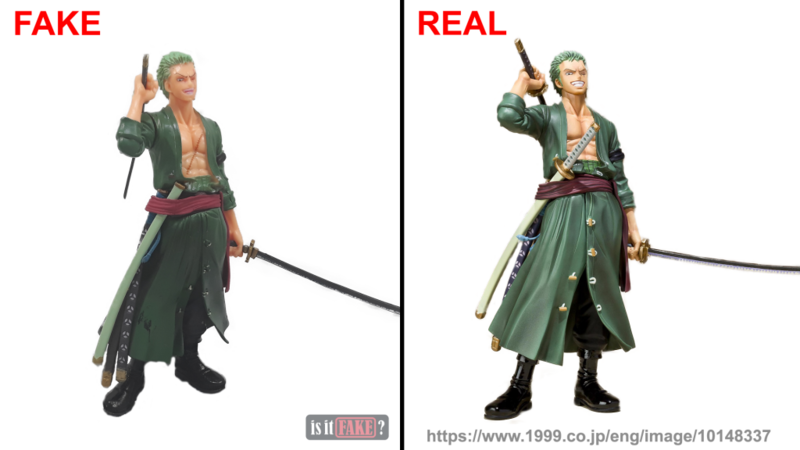 As far as this information goes, the base could probably disguise the fake Figuarts ZERO Zoro figure – probably not! 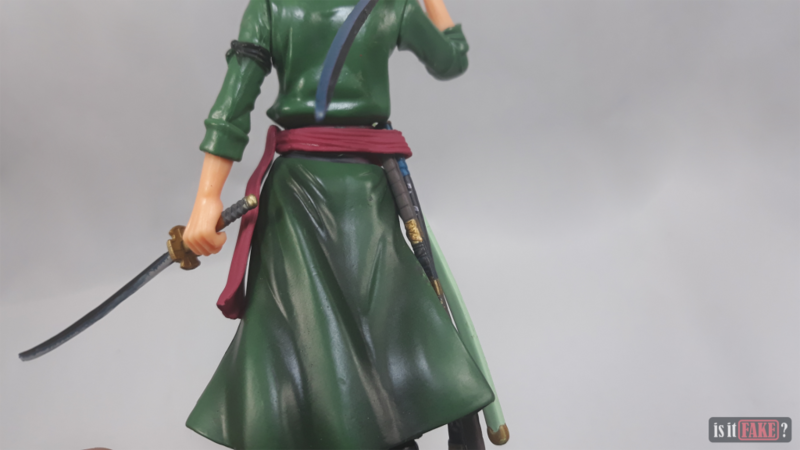 The fake figure, at a glance, looks a bit dull as it’s lacking in shading. Looking closely at its facial features, its scar look like it was only drawn with a stroke of ballpoint pen. It’s faded like the details on its teeth. The supposed earring on its left ear looks like dripping paint. With a closer observation, there is something off about the depth of the fake figure’s body. You’ll notice that it lacks in the mentioned quality. 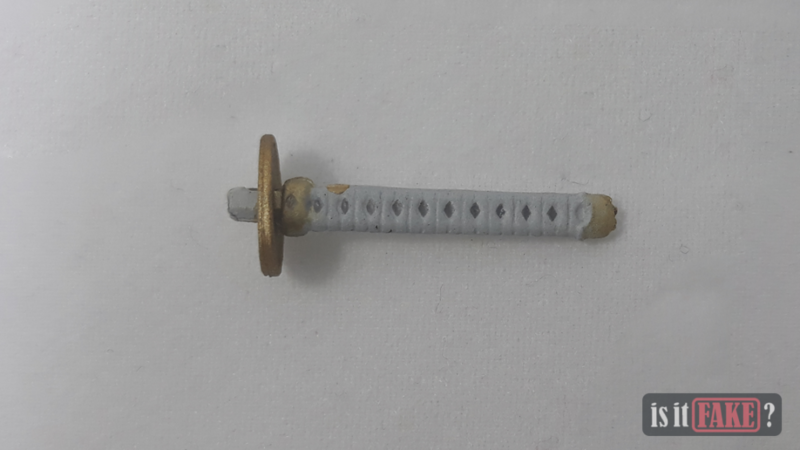 And to wrap up its flawed upper body, there are several spots and chipped parts that can be found in the said area. 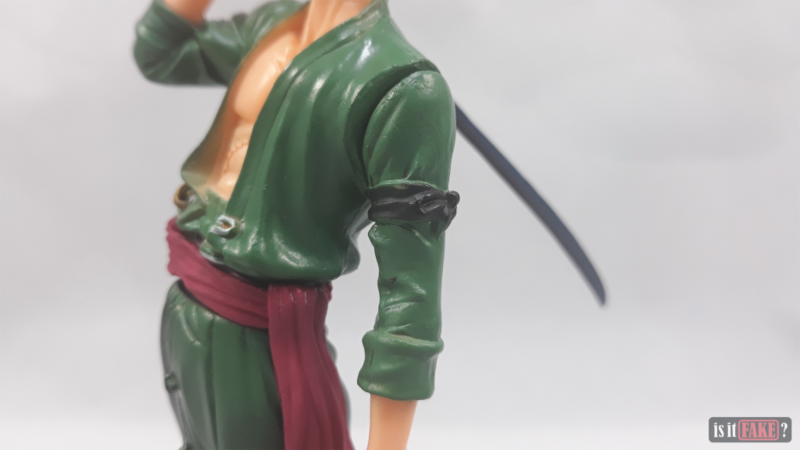 Since we’ve already taken attention on the upper body’s chipped parts, the lower body of the fake figure isn’t that much different. It’s awfully filled with scratches, not to mention the few spots of ink in that particular area of the bootleg. 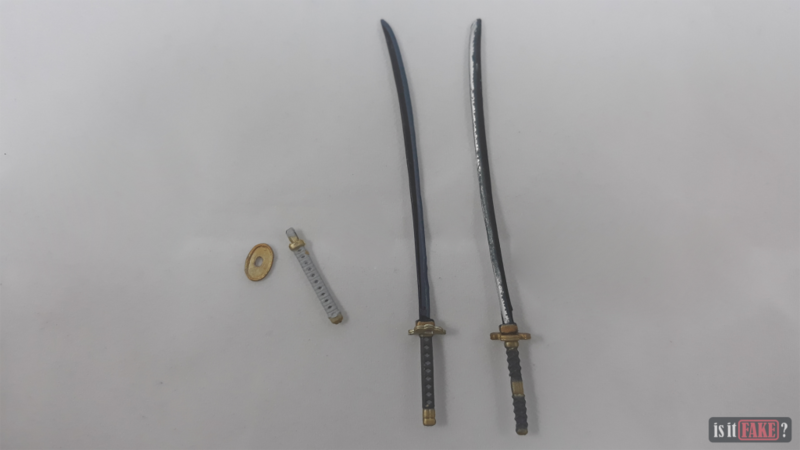 Last but not the least, we have the swords and the sword sheaths. If you’re wondering why we put it last, then because it’s the most obvious thing you’ll ever see. 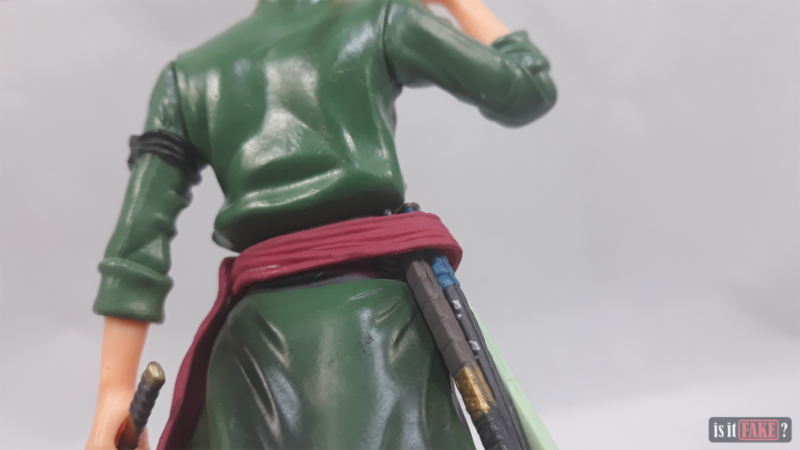 For one, the paint job on the fake Figuarts ZERO Zoro figure’s swords are just dreaded with misalignment and missed targets. Another is that the colour is just faded for these poor accessories. You’ll also notice many inconsistencies in the patterns, marking the figure as a knock-off. 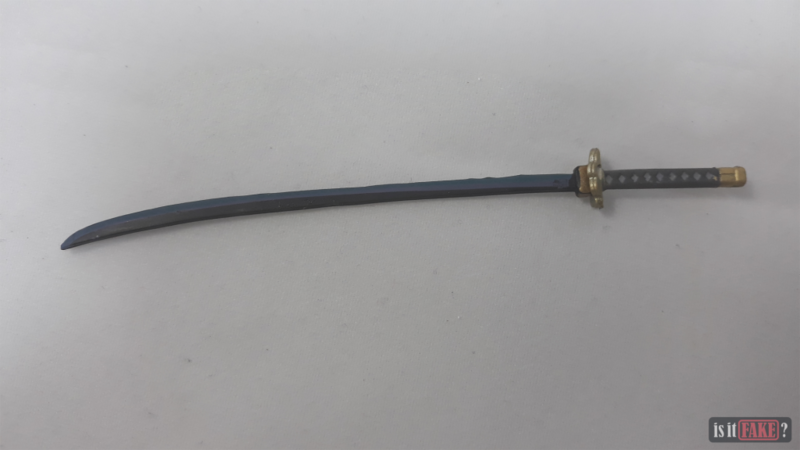 Sadly, the Wado Ichimonji sword handle that was meant to fit a sword sheath couldn’t be attached to any of them. 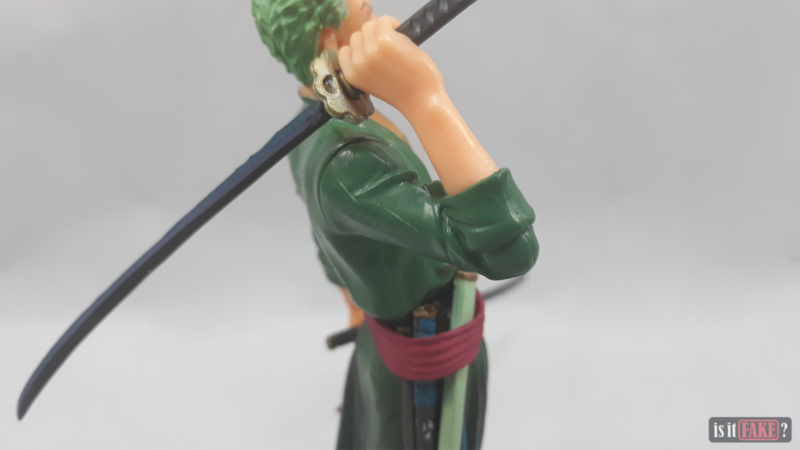 After a moment of eyesore comes the real Figuarts ZERO Roronoa Zoro figure. Looking at images of the real figure, you’d be able to spot countless flaws. 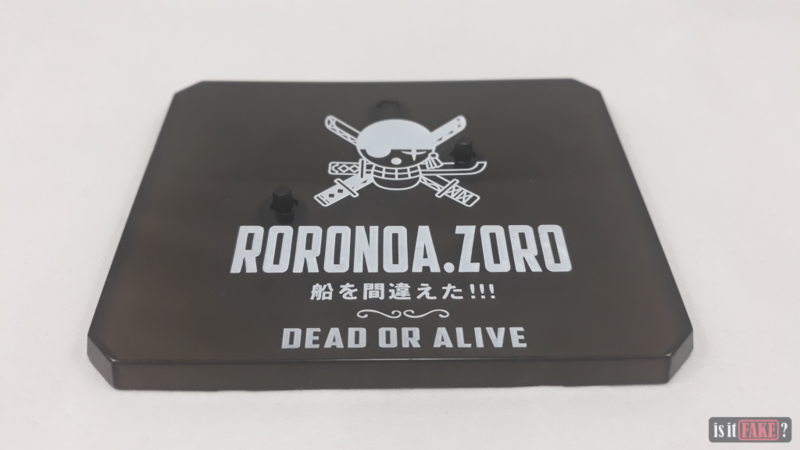 One that stands out are the buttons on Roronoa Zoro’s clothing. 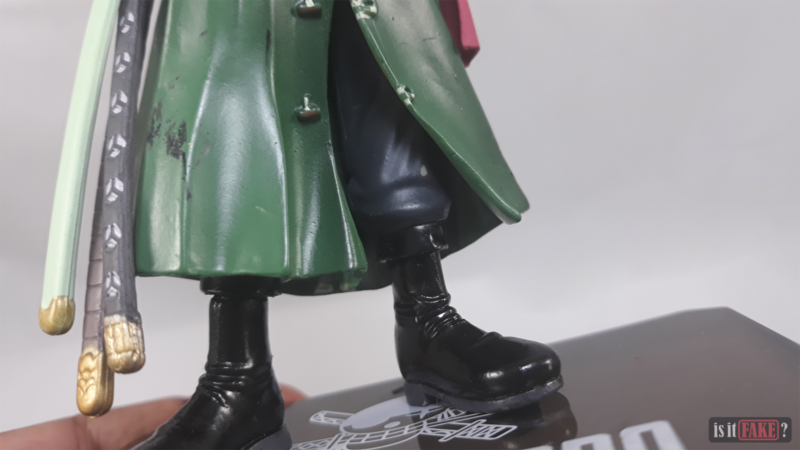 The real one has gold buttons while we see the fake figure full of scratches instead. There’s no denying it. Bootlegs are just far too inferior than the real deal. 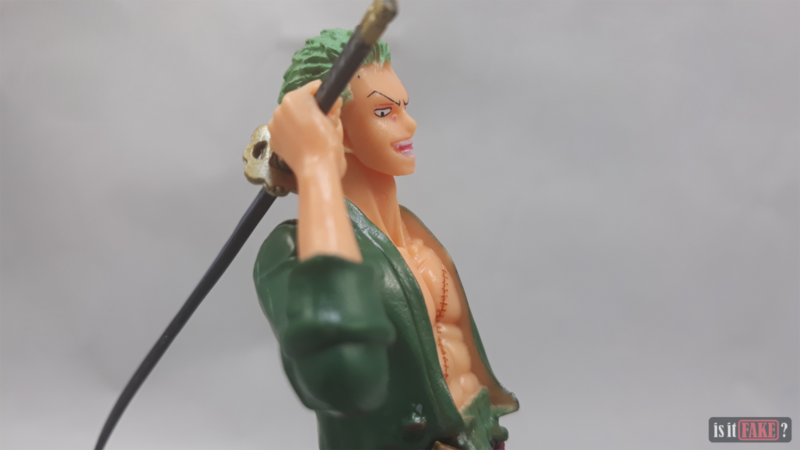 The real Figuarts ZERO Zoro figure states the obvious. 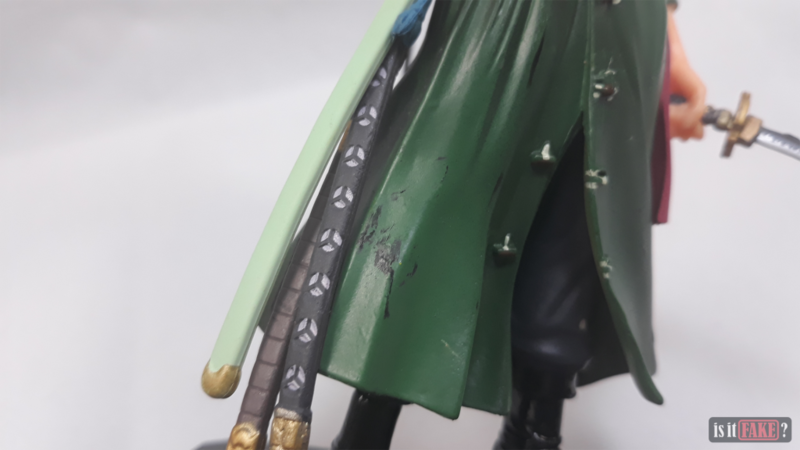 The details are just on point and are truly faithful to the anime character. The colour and shading feels alive. Real and authentic figures are just absolutely brilliant. 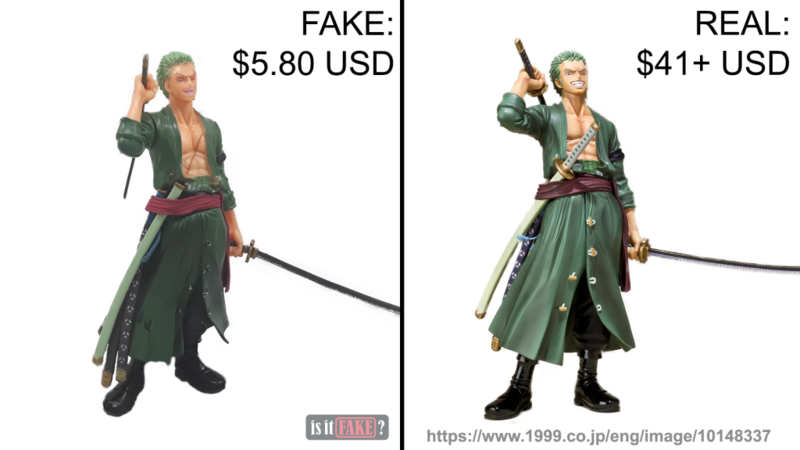 As for the fake Figuarts ZERO Zoro figure, its price is literally just going to steal from your wallet. For $5.80 USD, you’ll be settling with a figure with a lot of spots, drizzles, and an awful sculpt. And don’t expect more from a cheap figure because that’s what they’re only good for. 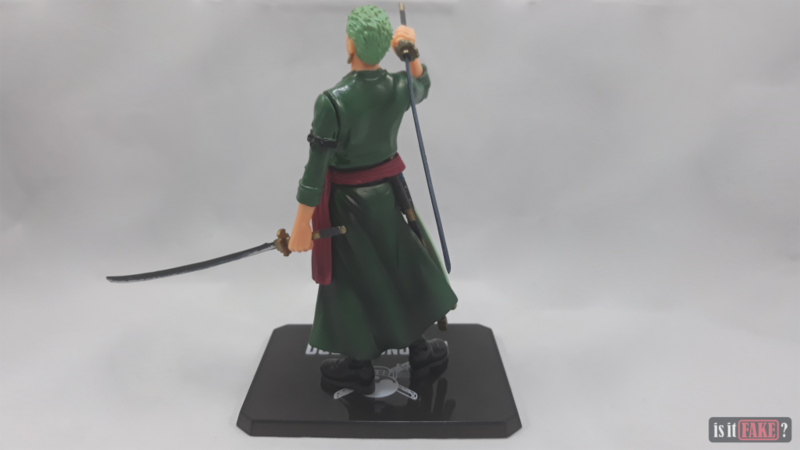 While the real Figuarts ZERO Roronoa Zoro figure costs about $41, the figure delivers what Bandai is all about – quality and inspiration. 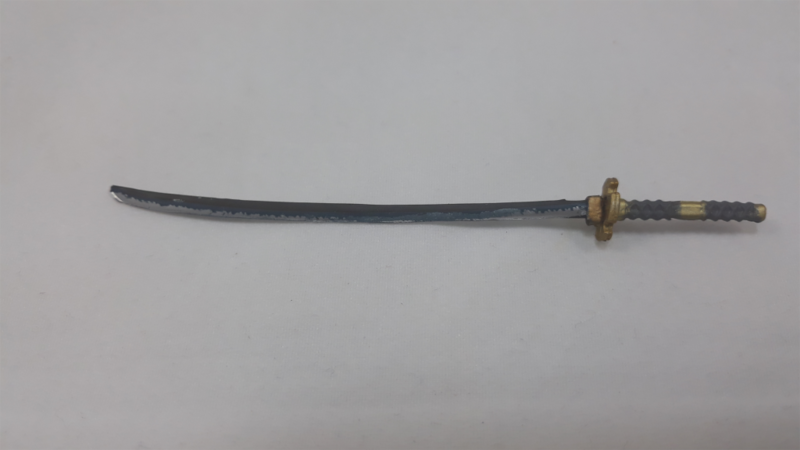 These are some of the reasons why you should buy the authentic figure for this price. 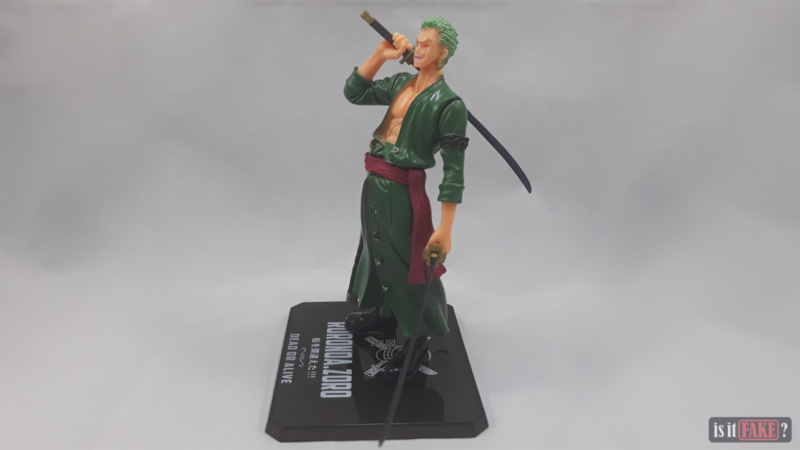 It’s because you want this figure to be worthy of being displayed on your desk, and because you are a true fan of One Piece. 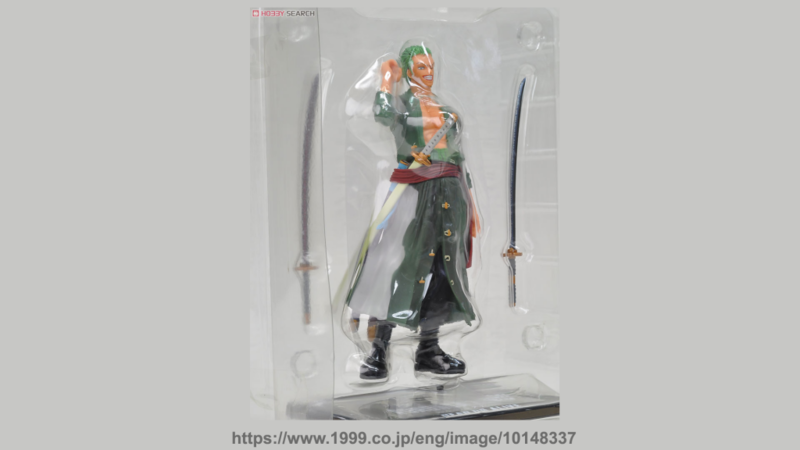 The Figuarts ZERO Roronoa Zoro figure was released in three batches in three different years, the last batch being 2014. Luckily, there are many reputable websites that are still selling the figure and are up for grabs. 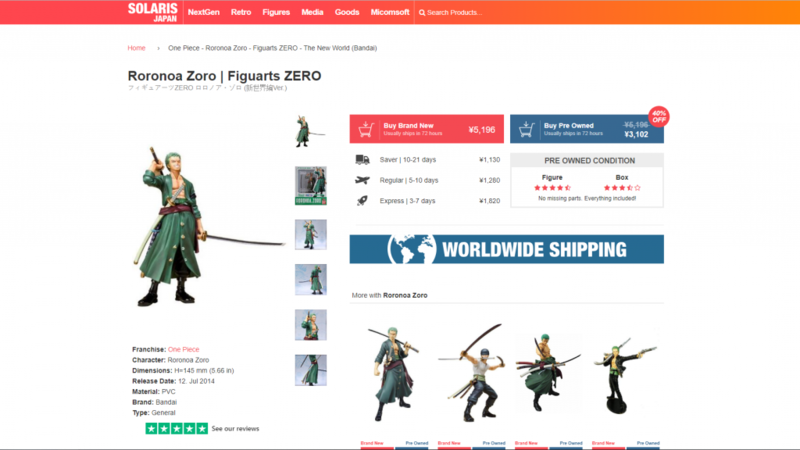 The safest bet in buying figures online would be at Solaris Japan. 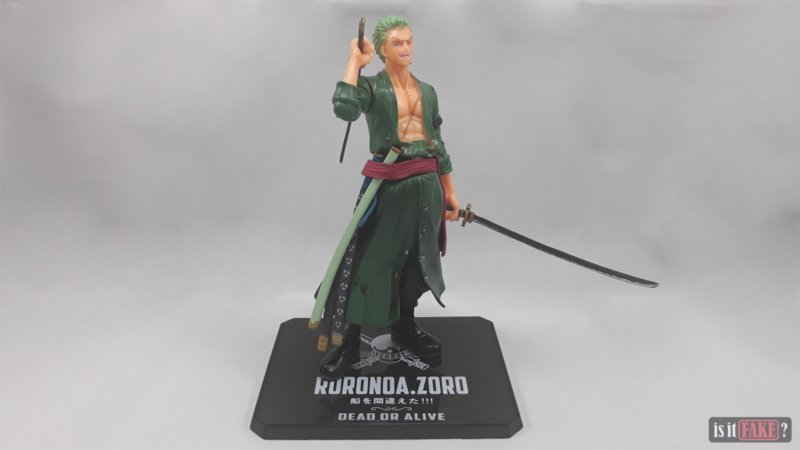 Not only that they are one of the few trusted websites to shop anime figures, but they’re also full of stock with new figures. 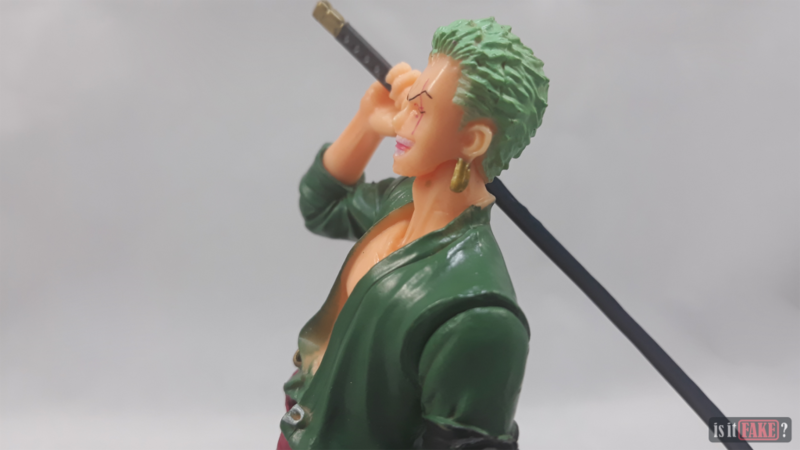 So if you’re thinking of getting the Figuarts ZERO Roronoa Zoro figure, or even any of Bandai’s One Piece figures, Solaris Japan should be your first stop. 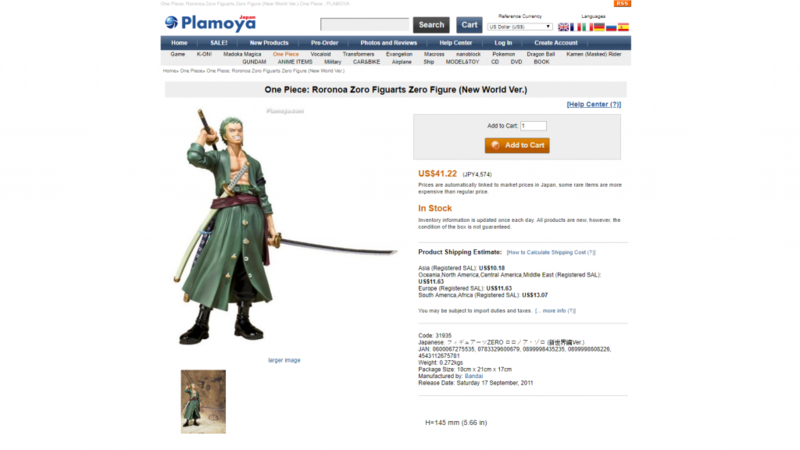 A relatively more affordable choice, however, would be to check out the figure at Plamoya. Like Solaris Japan, Plamoya is one of those websites that are well-reviewed. They also offer worldwide shipping, although at a separate fee. The website might feel a little bit dated but the content is pretty much filled with a solid selection of figures. 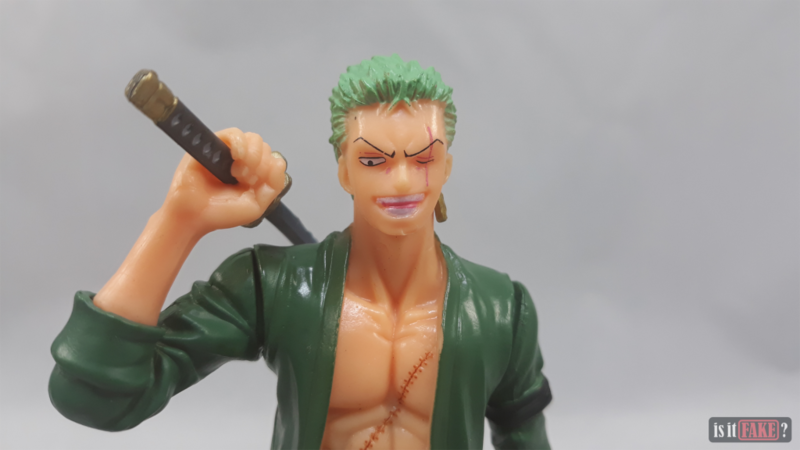 After all, anime figures are inspired by anime characters. 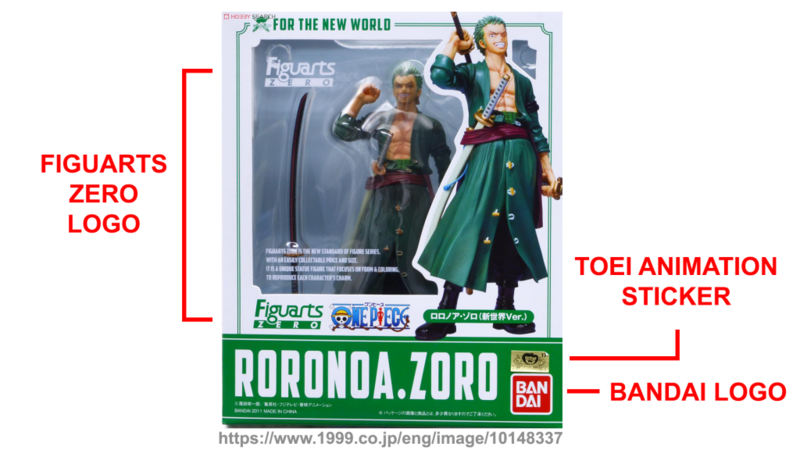 Would you say that the fake Figuarts ZERO Roronoa Zoro figure is inspired by the Roronoa Zoro in the anime? Not in a million years. 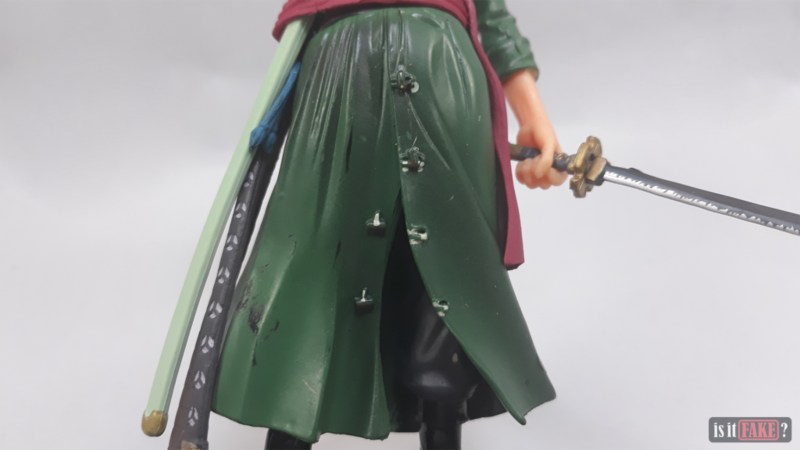 The fake figure is full of defects, from its sloppy paint job and messy presentation. The details on this bootleg are so inferior that it’s just as worthy as crumpled paper in a trash bin. 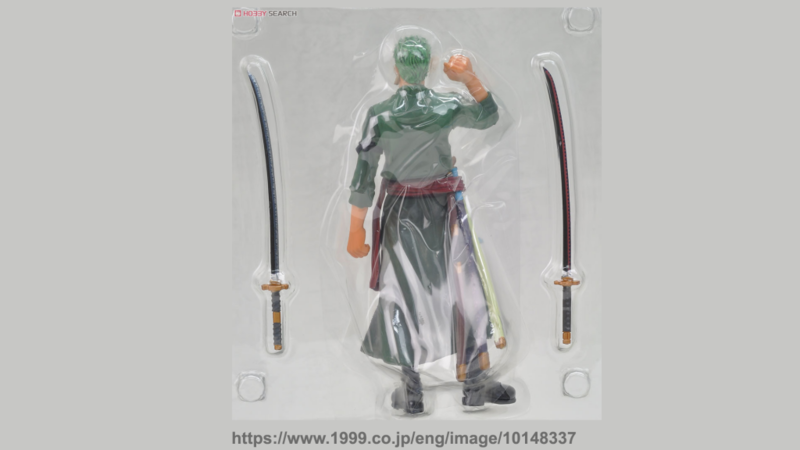 Bandai will never guarantee support for this knock-off and neither will the bootleggers as they’re only after your money. 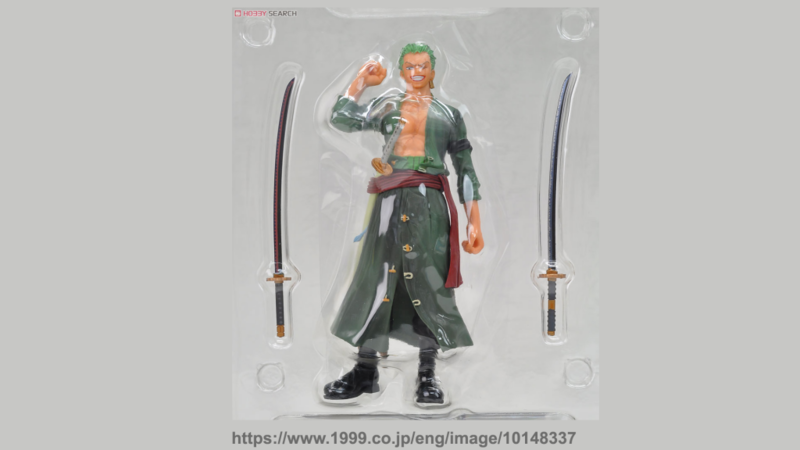 Needless to say, the fake Figuarts ZERO Roronoa Zoro figure does not deserve to be in your figure collection, but a slam of a 90% terrible rating is what it needs.